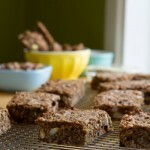 Oil-free, sugar-free granola bars that are super crunchy and hold together wonderfully. Spiced with chai masala and sweetened with dates and banana. Preheat oven to 325F and line a rectangle pan with parchment paper draping over either side for easy lifting, The size of pan will dictate the thickness of your bars. I used a 10×6. Place medjool dates in a bowl and cover with hot water. Leave to soak for 30 minutes. Drain well and set aside. Roughly grind your nut and seed mixture. There can be large and small pieces throughout the mix, just make sure there are pieces no bigger than the size of your pinky nail. Combine mixed nuts and seeds will hemp seeds, currants, roughly ground flax seed and roughly ground chia seed in a large bowl. Set aside. Mash soaked dates with a potato masher or fork until smooth. Add banana and mash together. Then, stir in almond butter and chai spice. Combine binding ingredients with the nut and seed mixture either with your hands, stand mixer or hand mixer. Mix until fully incorporated. Press into prepared pan and bake in the oven for 35-40 minutes, until edges begin to get golden. Remove from the oven, lift from the pan and allow to cool for 5 minutes. Cut into desired size and place on a baking sheet. Return back to the oven and cook for an additional 15 minutes to crisp up. Remove from the oven, turn onto a cooling rack and allow to cool completely. 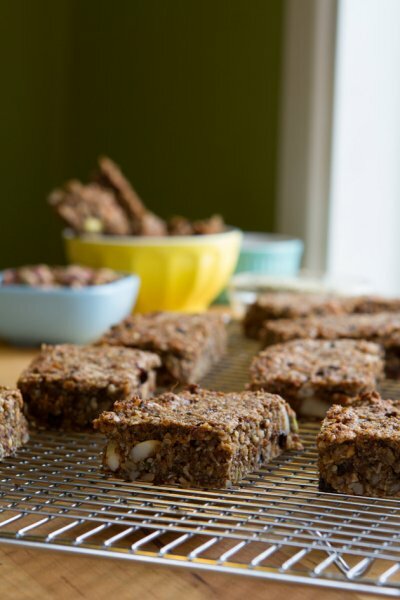 I used a mixture of: ½ cup unsweetened shredded coconut, ½ cup raw Brazil nuts, ½ cup raw sunflower seeds, ¼ cup raw walnuts, ¼ cup savi seeds, and ¼ cup shelled unsalted pistachios. If you’re sensitive to banana, try replacing it with ¼ cup unsweetened apple sauce. Can be stored in the freezer in an airtight container for up to 3 months.